Check out the teaser trailer for The Nun. 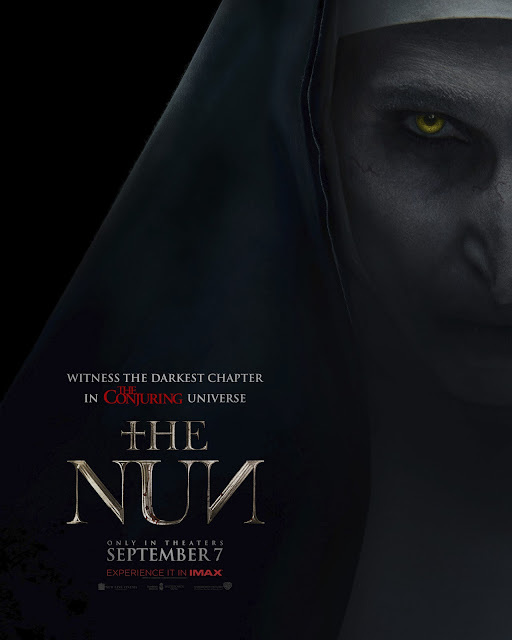 “The Nun” stars Oscar nominated Demian Bichir (“A Better Life”) as Father Burke, Taissa Farmiga (TV’s “American Horror Story”) as Sister Irene, and Jonas Bloquet (“Elle”) as local villager Frenchie. The cast also includes Charlotte Hope (TV’s “Game of Thrones”) as the abbey’s Sister Victoria, Ingrid Bisu (“Toni Erdmann”) as Sister Oana, and Bonnie Aarons, reprising her “Conjuring 2” role as the title character. Hardy directs “The Nun” from a screenplay by Gary Dauberman (“It”), story by James Wan & Gary Dauberman. Richard Brener, Walter Hamada, Dave Neustadter, Gary Dauberman, Michael Clear and Todd Williams are the executive producers. Joining Hardy behind the scenes are director of photography Maxime Alexandre (“The Voices,” “Annabelle: Creation”), production designer Jennifer Spence (“Annabelle: Creation,” “Lights Out,” the “Insidious” films), editors Michel Aller (“Lights Out,” “Paranormal Activity: Ghost Dimension”) and Ken Blackwell ( “Ouija” “Friday the 13th”), and costume designer Sharon Gilham (TV’s “Black Mirror”). The music is by Abel Korzeniowski (“Nocturnal Animals”). Opening in theaters on September 7, 2018.